This tool is meant to support a universal design approach to environments for aging populations. The following items should be considered as general guidelines (or “thought starters”), and not as comprehensive specifications. The considerations are best reviewed at the very beginning of a project, even before programming, to assess strengths, identify needs, and establish a vision for short- and long-term plans. Upon project completion, this tool can guide a discussion around implementing processes that align with the new design. 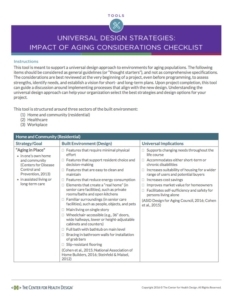 Understanding the universal design approach can help your organization select the best strategies and design options for your project.